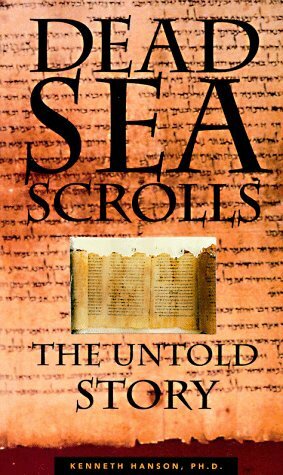 Currently reading the book, Dead Sea Scrolls: The Untold Story by Kenneth Hanson. The Dead Sea Scrolls is a name given to a general collection of scrolls found in the area of Qumran, in the desert near the Dead Sea in the West Bank of the Jordan River. The first scrolls from this region were found in 1947/48. Many more scrolls have been found since then (and there may be some still missing, or hidden, by various regional authorities and antiquities dealers and collectors), including some in areas as far away as the British Museum (manuscripts collected from a Cairo genizah 50 years earlier were later found to match the scrolls). If you read the real interpretations of the Dead Sea Scrolls, the whole picture of Judio-Christian History will look upside down. "An entertaining but sensationalised book which contains some fascinating reinterpretations of history. The Dead Sea Scrolls were discovered from 1947 onwards in caves in cliffs at Qumran. Since then (the book claims) the scrolls have been jealously guarded by a group of Catholics who got possession and control of them, and only fragments have been published with a distorted Catholic interpretation. The scrolls are the records of Jewish zealots living around the time of Christ. Zealots believed passionately in three things:1 - The Law of Moses.2 - A line of high priest messiahs (the word means "anointed ones" - their priests as well as their kings were anointed) descended from Zadok.3 - A royal line of messiah (anointed) kings descended from Solomon and David. The zealots hated foreigners and anyone who did not uphold the Law. This of course included the occupying Romans (who believed their emperor was God) and their puppet-kings of the Herod dynasty, and Herod's puppet high priest in the Temple (called by the scrolls "the wicked priest") Ananas. Groups of zealots lived all over Palestine and were variously called Zadokites, Zealots, Sicarii, Essenes and Nazorenes. This word comes from "Nozrei ha-Brit": "keepers of the Covenant" which gave "Nozrim": a sect later known as Christians. Jesus was a Nazorene; he did not come from Nazareth, which did not exist at the time. The zealots were militant revolutionaries organising resistance to the Romans and their puppets. Jesus's brother James is called by the scrolls the "teacher of righteousness". He lived in Jerusalem and was the zealot leader. Paul is called by the scrolls "the liar". Originally a Roman collaborator, he was converted on the road to Damascus (Qumran, not the one in Syria) and joined the zealots. But he was not so keen on upholding the Law. He wanted to start a new religion, and gain many adherents by relaxing the rules. He was an advertising man at heart, and distorted the story of Jesus's life for popular appeal. It was Paul who said that Jesus was divine, and invented many of the miracles and the virgin birth. He was a thorn in the side of James and the strict zealots, and they packed him off on missions around the world. He is the hero of the Acts of the Apostles, which is written from his point of view, and is the basis for modern Christianity. The scrolls, however, show that Jesus was not the meek and mild, mythologized son of God, but a politically active teacher who strongly upheld the Law and the Prophets. Paul was possibly a Roman agent. He hijacked Judaism and turned it into a religion Jews could no longer accept." God willing, I will be posting more interesting stuff regarding Dead Sea Scroll in next few posts. Search more books on Dead Sea Scrolls at Google Book.